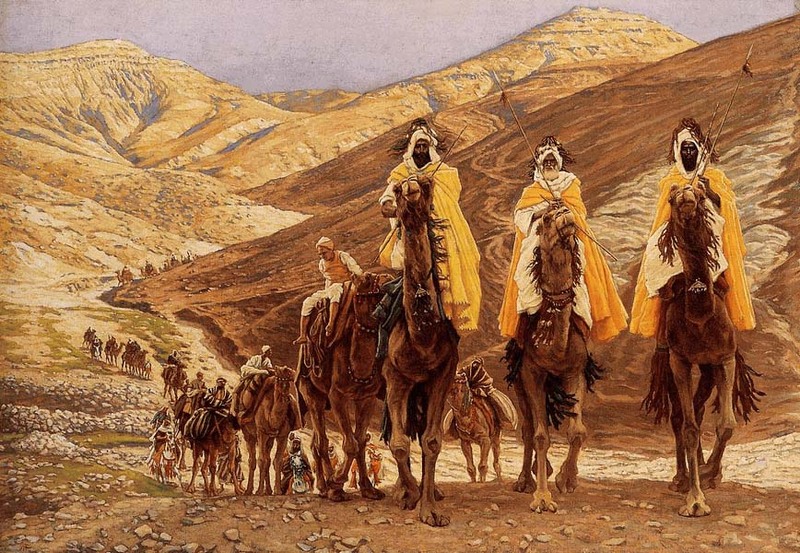 "The Journey of the Magi" (1894) by James Jacques Joseph Tissot (French painter and illustrator, 1836-1902), oil on canvas, Minneapolis Institute of Arts. Larger image. bearing gifts, we traverse afar..."
They weren't kings. We're pretty sure of that. Nor were there necessarily three of them. Nor did they go by the names Caspar, Melchior and Balthasar.1 But who were they and why did they come? How do they fit into the story of Jesus' infancy? All of a sudden an elaborate entourage from the East appears in Jerusalem at Herod's court inquiring about the birth of the "King of the Jews." Parthia or Persia. The term magoi was first associated with the Medes and the Persians. We know that astrology flourished in this area and that the astral lore of the region was applied to royal births. Babylon. The Babylonians or Chaldeans had a well developed interest in astronomy and astrology. A large colony of Jews remained there, so astrologers could have learned of Jewish messianic expectations. Also, magoi are referred to in Daniel's description of the Babylonian court. Which of these is most likely? We can't really say. At any rate, they were men of wisdom and learning from an exotic, far away land bringing a caravan into the capital city of the Jews, seeking a newborn king. They must have attracted attention. A supernova or "new star." A supernova is an explosion in an existing star that for several weeks or months gives out a great deal of light, sometimes even visible during the day. A dozen novae are discovered each year, but those visible to the naked eye are rare. There is no historical record of a supernova just before Jesus' birth date. A comet. Throughout history, comets have captured human imagination. A comet's nucleus is made up of rock, dust, and ices. Its tail can be spectacular. The sun's radiation pressure and solar wind cause an very long tail to form, which points away from the sun. Astronomers have calculated that Halley's comet would have been visible 12-11 BC, years before Jesus' birth about 6 BC. We just don't know enough to say authoritatively exactly what the Star of Bethlehem was. The initial reference seems to be to David. Prior to Christ, Jews of the Qumran community saw this prophecy as messianic. Later Judaism considered the messianic claims of Simon bar Kochba ("son of the star," 132-135 AD).8 Could the messianic expectation based on this verse among Jewish communities in the East be the basis of the Magi's interpretation of the star? We don't know. Q1. (Matthew 2:1-2; Numbers 24:17) What is the significance of the Star of Bethlehem that the Magi saw? Why do you think the Magi came to find the Christ-child when they saw the star? In what way was does prophecy prefigure this event? 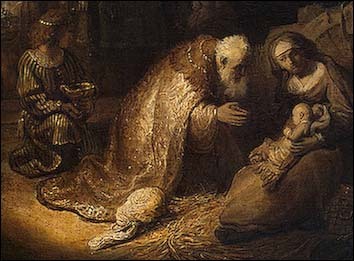 Herod was troubled because he saw this newborn as a threat to his own throne. The people were troubled because they had seen what their paranoid king had done when he felt his throne threatened. A later Roman philosopher quotes Roman emperor Caesar Augustus as joking "I'd rather be Herod's sow than Herod's son." Herod didn't eat pigs, but he murdered his sons. Afraid of intrigue among his many sons to become king, two were tried and executed by strangulation just the year before Jesus' birth -- about 7 BC.11 A third was executed five days before Herod's death in 4 BC. Matthew's report of both Herod and his citizens being "disturbed" at the Magi's report rings true. Herod takes the Magi's quest seriously. 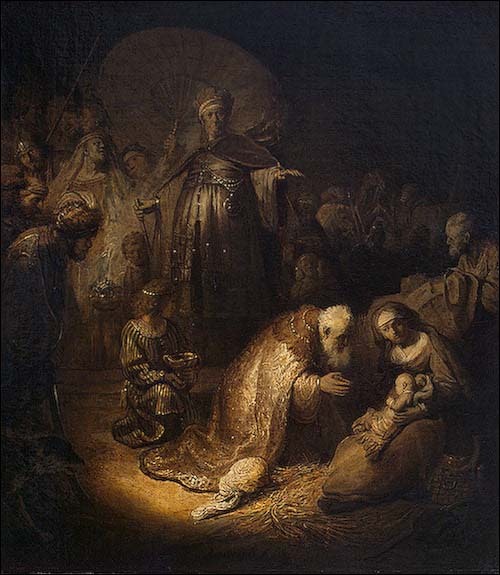 Note that the Magi came seeking "the one who has been born king of the Jews" (2:1), but Herod asked the scholars where the Messiah (Greek Christos) would be born (2:4). He understood immediately that this child they sought was no normal king, but the Messiah himself. Herod wasn't a descendent of David. He was rather a Edomite (Idumean) son of a ruling family in whom the Romans had seen a talent for controlling the populace. He had been appointed governor of Galilee (47 BC) and later King of the Jews (37 BC). He realized that if a descendent of David were to rise, his reign and that of his descendents would be over. Messiah or not, this child must be destroyed. The prophet Malachi (5:2) made it clear that Bethlehem would be the birthplace of the Messiah, so in Bethlehem the quest would continue. Herod's questioning of the scholars was public, but his interrogation of the Magi is secret.12 He finds out precisely13 when the star appeared. Later he uses this information to slaughter all the boy babies in Bethlehem two years and under (2:16). Apparently the Magi had seen the sign two years previous. The star that inspired their trip in the first place now leads them directly to the very home where the Christ-child dwelt. By this time, presumably nearly two years after Jesus' birth, Mary and Joseph were living in a house (oikia17). While most nativity scenes have shepherds bumping into wise men and angels, this almost certainly was not the case. The Holy Family had left the stable and found a house. Probably Joseph had found employment as a carpenter. They had apparently decided not to return to Nazareth, perhaps because of the scandal over Mary's pregnancy prior to marriage. Even though Joseph publicly accepted the child as his own, premarital relations were considered a sin; the couple would have had to deal with considerable prejudice. But now, outside their home, a caravan of exotic travelers has stopped. Strangely dressed men are approaching while their camels are attended by servants, while other servants are carrying gifts in their hands. Mary scurries around to straighten up while Joseph goes out to meet the strangers. Rembrandt, detail of "The Adoration of the Magi" (1632), Oil on paper pasted on canvas, 45x39 cm, Hermitage Museum, St. Petersburg. Full image. We're not told the details, of course, but when the Magi see the child, now a toddler, they bow down (piptō18) and worship (proskuneō) him. Imagine these old men, finely dressed, prostrating themselves on a dirt floor before a small child. They had seen the star and it had reappeared to guide them. These men were convinced -- rightly -- that they were standing before the Messiah, the King of the Jews. Their obeisance was fitting. Q2. (Matthew 2:11a) What do we learn from seeing the Magi prostrating themselves before the child Jesus? What was the significance of this for them? How can we emulate this kind of worship? After lying prostrate for some time, they rise, perhaps at the urging of Joseph. Whenever foreign dignitaries would appear before a great king they would bring gifts as a sign of obeisance and honor. "Treasures" (NIV, KJV) is probably better translated "treasure chests" (NRSV).19 And as the lids were lifted, the glitter of gold and aroma of precious spices filled the room. The song is popular, though the sentiment is profound. Our best, no matter how seemingly insignificant, is what we owe the King. That is what characterized the Magi's gifts. Though the Magi's quest had brought Herod's scrutiny upon the child, these gifts were probably sold gradually to provide for the Holy Family during three years of exile in Egypt where they fled to escape Herod's wrath. Q3. (Matthew 2:11b) Why was it appropriate for the Magi bring gifts to the Christ-child? How does the extravagance of their gifts reflect their heart attitude? What kinds of gifts are appropriate for us to bring? Though Herod had recruited the Magi for his evil plot, God warned them in a dream not to participate, so they left the area without returning through Jerusalem, only six miles to the north. This probably bought the Holy Family a day or two of time to make good their escape. The story concludes in 2:13-23 with Joseph being warned in a dream and that very night taking his young family -- with the treasures -- and fleeing for Egypt, out of Herod's jurisdiction and reach. It was good that they did flee rather than question God's messenger. As soon as Herod discovered that the Magi had betrayed him, in a furious rage he gave orders to kill all the male children in Bethlehem who were two years of age or under. This amounted to perhaps twenty baby boys, the first martyrs for the Messiah. The King Heralded by a Star. Matthew points to the fulfillment (without saying so) of Balaam's ancient prophecy that "A star will come forth from Jacob, and a scepter will rise from Israel" (Numbers 24:17). The King Honored by Foreign Nations. One of Matthew's themes is that Christ fulfilled Old Testament prophecy. Here the prophecy isn't cited, but only alluded to: that of foreign rulers bringing their riches to honor the King of Israel (1 Kings 10:2, 10; Psalm 72:10-11, 15; Isaiah 60:5-6, 11). This account points to Jesus' royalty as King of the Jews. Enemies of Christ Seek His Death. Here in chapter 2 is the beginning of Jesus' enemies. Herod clearly covets Jesus' claim to be Messiah and seeks to kill him before he can become a threat. Later in Matthew's gospel the "chief priests and teachers of the law" who pointed to his birthplace in Bethlehem conspire to take his life. And ultimately he is crucified for this very charge of being King of the Jews (Matthew 27:11, 37; John 18:33-37; 19:19-22). Explanation of Jesus' Infant Sojourns. From Nazareth to Bethlehem, from Bethlehem to Egypt, and then back to Nazareth where he was raised -- Jesus' journeys as an infant needed an explanation in the face of Jewish belittling him as a citizen of Nazareth (John 1:45-46), not from the royal city of Bethlehem. The Gospel to the Gentiles. This account also points to another important theme -- that Jesus came to the Jews, but had a mission beyond Israel to the Gentiles (Genesis 12:3; 22:18; 28:14; 49:10; Psalm 22:27; 98:3; Isaiah 49:6; 66:19) In parable (Matthew 21:33-44; 22:2-13), action (Matthew 8:5-13), prophecy (Matthew 24:14), and command (Matthew 28:19; Acts 1:8), Jesus underscores that the gospel must be preached to -- and will be embraced by -- the Gentiles. Q4. Read Matthew 8:5-13; 21:33-44; 22:2-13; 24:14; and 28:19. What do they have in common? What relation does the visit of the wise men have to Matthew's theme of bringing the Gospel to the Gentiles? How should we be applying this mandate in our own lives? Devotion by Men of Wisdom. That wise men recognize the Messiah and bow at his feet is also an example to "the wisdom of this world" (1 Corinthians 2:6). The Sovereignty of God. Finally, we see in Joseph an obedient servant of God, who hears the angel's warnings in dreams and takes immediate action to protect the Christ-child in his charge. Though the powers of this world may array themselves against the Christ and his people, God is fully able of protecting and preserving them until they have completed their mission. The gifts of the wise men serve to honor the boy-King and to provide for his shelter for years to come. Where one door closes, another opens. God provides! Father, thank you for letting us hear the story of the Magi who knelt before you with devotion and brought you rich gifts. Let us have that kind of wisdom, that we may bring before you with extravagant worship the gifts you have given to us. We love you, Lord Jesus. In your holy name, we pray. Amen. These names for the Magi in the West derive from an early 6th century Greek manuscript. However Eastern churches and Armenians have different names for them. Magos, BDAG 608. Good discussions are included in Brown, Birth, 167 and Gerhard Delling, "magos, ktl." TDNT 4:356-59. Werner Foerster, astēr, astron, TDNT 1:503-505. Brown, Birth, p. 195, fn. 47 gives references to the Qumran literature. See also R.K. Harrison, Numbers (Baker, 1992), pp. 321-324. In the book of Revelation Jesus says, "I am the Root and the Offspring of David, and the bright Morning Star" (Revelation 22:16). On the Messianic expectation in later Judaism, Foerster (TDNT 1:505) cites Strack and Billerback I, 13c, 17f. Abrosius Theodosius Macrobius, The Saturnalia. Macrobius was a Roman philosopher of the fourth century AD. Josephus, Antiquities, xvi.10.6-11.8; Wars i.27.1-6. Harold W. Hoehner, "Herod," ISBE 2:688-698. Lathra, "without others being aware, secretly" (BDAG 581). Akriboō, "make detailed inquiry about something, ascertain precisely/exactly." (BDAG 39). Oikia, "a structure used as a dwelling, house" (BDAG 695, 1.a.). Piptō, "fall," here, to "fall down, throw oneself to the ground" as a sign of devotion or humility, before high-ranking persons or divine beings, especially when one approaches with a petition. (BDAG 815-816, 1.b.a.Bet). Thēsauros, "a place where something is kept for safekeeping, repository ... treasure box or chest." It can also mean that which is stored up, "treasure," but the context of opening here suggests the chest. We get our English word "thesaurus" from this word. (BDAG 456). George A. Turner and Ralph W. Vunderink, "Gold," ISBE 2:520-522. R.K. Harrison, "Frankincense," ISBE 2:360. R.K. Harrison, "Myrrh," ISBE 3:450-451. Edersheim, Life and Times 1:214. Edersheim, Life and Times 1:214, fn. 1. "The Little Drummer Boy," by Katherine K. Davis, Henry Onorati and Harry Simeone. Copyright �1958, EMI Mills Music Inc., International Korwin Corp. (ASCAP).